The Dictionary of Unfortunate Ideas: You Say Frankenstein Is How Tall? Well, I Never Thought I'd See the Like! A World Without America? Bloody Hell. Toys that read your mind! You Say Frankenstein Is How Tall? After reaching this earthshaking conclusion, one must then take the next step and realise that of all the monster film genres out there, the zenith of IQ-challenged monster flicks is the Japanese monster film. If sushi had brains, it would be too smart to make these films. Don't get me wrong, this recognition is in no way meant to slight the Japanese people or their magnificent film industry. Japan has produced many of the world's greatest filmmakers: Kurosawa, Mizoguchi, Ozu, Subaru, Nissan, Mitsubishi... excuse me, I'm getting confused with Japan's fine car manufacturing industry. I'll start again: Kurosawa, Mizoguchi, Ozu, Ichikawa, Kobayashi, Imamura, and Ito, just to name a few. Not coincidentally, not one of these directors made a film that features Godzilla. One must start with Godzilla of course. Godzilla is nicknamed the "King of the Monsters." While this is a misnomer, as every schoolchild knows that Alec Baldwin is the "King of the Monsters," nonetheless, Godzilla is without a doubt the "King of the Really Fake and Stupid Looking Monsters that Like to Smash Model Cities." Godzilla is their king and chief role model. He is also, without question, the best actor among them. I mean, just consider the style that "Gojira" (his correctly pronounced Japanese name) employs. He stomps his feet in anger with the playful ferocity of a vexed Lindsay Lohan. He tosses his massive scaly head with all the aloof disdain of a Jennifer Lopez. He bristles his radioactive spinal ridges with all the sour arrogance of Donald Trump's hairdresser. (Of course, given Trump's hair, Godzilla may in fact be his hairdresser. ) Godzilla really and truly shows us his feelings, as Raymond Burr watches with deep seriousness in the inserted footage, concerned that he is being upstaged by a highly agitated young Japanese man in a lizard suit. My favourite Godzilla fighting tactic is his "atomic breath." Godzilla is purportedly radioactive because nuclear fallout mutated him into the 400-foot tall giant dinosaur-like polyutherane skink he is. Of course, real radiation has never been known to actually grow things to gigantic size except in the movies - on this matter the Japanese films are miles ahead of the game, as in American films the radiation generally only giganticizes, if that is a word, peculiar-looking militaryofficers (War of the Colossal Beast) or saucy, drunken tarts with no-good cheating bastards for husbands (Attack of the 50-foot Woman). Even here though, Japanese growing radiation is clearly superior to the American variety. Godzilla was 400-feet tall. What good does being irradiated do for a woman if, after growing to 50-feet high, some massive newt can still come along and scrape her off the bottom of his big rubber feet. The Colossal Beast (Man, whatever) would be Godzilla's football. Anyway, the atomic breath was delightful indeed. Godzilla's scales would glow and a glowing, presumably fiery light would eject from his mouth. Imagine Linda Blair from The Exorcist being 400-feet tall and instead of spitting up pea-soup, she regurgitates Campbell's Cream of Mushroom soup that not only glows but makes everything it touches blow up. As children, we tried to replicate this, but not even extra-garlic and onion in the soup would ignite things. Of course, Godzilla also stepped on buildings. He did this with alarming regularity. The model buildings in Godzilla films were incredibly obvious as models, but that still didn't keep us as children from being remarkably impressed that Godzilla was so powerful that he could shatter steel and brick as though it were cardboard and balsa wood. The Tokyo insurance adjustments in Godzilla's world must have been astronomical. However, as entertaining as this super-Premium petrol breath and massive insurance fraud was, it was also incredibly stupid. Imagine Godzilla trying to hit it off with a lady giant lizard. He chats her up at the giant monster pub. He asks her out to a drive-in cinema. They snack on a few cars before the feature. Then, he leans over to gently whisper some sweet nothing in her ear ...and blows her ruddy head off by accident. Perhaps this is why the Godzillasaurus became more or less extinct. As gormless as the Godzilla films were though, Toho, the studio that produced them, managed to come up with even more absurd items. Take for instance Mothra (or "Mosura" in the pure Japanese). You might think "Mothra" is some ancient Japanese word describing a gigantic bear or leopard, with razor-sharp claws and an attitude that would make Gordon Ramsay soil himself in fear. No, "Mothra" is just a really, really big moth. This would be bearable if not for the sad fact that Mothra is constantly accompanied by, in some way or another, two tiny little women. Yes, you have it correct: Giant moth, miniature women. Everything is upside down in Mothraville. In addition, these geisha knockoffs incessantly sing the "Mothra" theme song, a high-pitched dirge only slightly more listenable than the ballad featured in Animal House concerning chickens with no bones. If these two little miniaturised gits had a guitar, John Belushi would've broken it. For that matter, so would have Godzilla. I think he did in a few films. 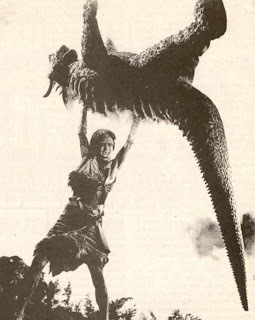 There was also Rodan, a giant pterodactyl who flew with relative grace but landed like a tuna on a fishing boat. Ghidera was a three-headed dragon who shot lightning from his mouth. Consequently, he was Toho's most popular monster, after Godzilla, even though he was a villain. For kids, he was simply the coolest of them all. For adults, they wanted to find out what he was drinking to make all that electricity, so they could bottle it and put it in cocktails. Jealous from all the money Godzilla was making Toho, Daiei Studios decided to create their own Tokyo-stomping, gigantic box-office machine. They thought very carefully about the kind of creature that would excite audiences into a frenzy of terror and ticket-buying. They wanted something dazzling and original, something magnificent, yet that would leave viewers trembling in cold sweats at the thought of such a creature let loosed on an unsuspecting world. After all this intense deliberation, they finally settled on... a giant, flying turtle named Gamera. Apparently, Gamera is Japanese for "underwhleming." Clearly, they had to go farther. For example, give a person a skillet and a flagon of extra virgin olive oil and how frightening can "mushroom people" truly be? Toho's solution was to look into the annals of great literature for the most frightening monster they could find. Unfortunately, instead of Dracula or Werewolves, they settled on Frankenstein's Monster. Oh, I know some of you are saying to yourselves, "Frankenstein's Monster? What could be wrong with him? He's terrifying!" However, if you think carefully about him, Frankenstein's Monster is nothing more than the reanimated body parts of normal human corpses. The only real frightening thing about him is his breath (which pales by comparison to Godzilla's). He's only tall because of the lifts in his boots. He's slow, he's uncoordinated, and he has a pathological fear of fire. How truly terrifying can a monster be, if you can hold him at bay for hours with a Bic lighter? Toho realised this and came up with a solution. If Frankenstein's Monster wasn't particularly frightening as an 8-foot tall, clumsy oaf, then he'd be truly frightening if he were... (wait for it) 400 feet tall! So, in other words, they reverted to form once the concept hit the producers' committees. Then they all presumably broke for lunch and a few hours at the driving range. The result was the epic monstrosity Frankenstein Conquers the World, also known as Frankenstein versus Baragon, and in Sweden as Frankelverde Smorsh-de Bork-Bork. Dr. Himashigura: Dr. Frankenstein, watch out! The growth ray is hitting you!! Dr. Frankenstein: Oh, dear! I've grown ever so tall! I'd better be extremely careful, so as not to trod on the city. I'll just lie down in the giant empty field and not move until we figure out what to do. Utterly boring old tripe, unless you're a molecular biologist, and even then you're still left with a pulled muscle from the suspension of disbelief. Fortunately, in the actual film, it is Frankenstein's Monster who gets ballooned to enormous size and, being as mad as Ken Russell, goes off on a destructive romp that makes a Led Zepplin hotel-trashing look like tea with the Windsors. Add to that a climactic battle with a gigantic, horned, burrowing Tor Johnson lookalike and you've got some classically mental filmmaking. It's moronically inventive crap like this that makes the Japanese versions of giant monster films so special. At the end of King Kong, he falls off of the Empire State Building and dies a tragic, supposedly moving death, as Carl Denham stands by and waxes philosophical, when he should have been giving the big ape CPR. For me, that's all as predictable as someone slipping on a banana peel. In the Japanese film world, they wanted to do a film about King Kong, so they asked themselves, "How would Kong have survived the fall that apparently killed him?" They answered this question with a resounding "Who bleedin' cares?" and promptly put him in an action flick with Godzilla. Oh, and they also increased his size to about 400 feet tall. Ah, the elegant, creative, predictable balderdash of it all! Utterly stupid, yes; yet a treasure-trove nonetheless.